Yes, I loved Star Wars: The Last Jedi. It was by no means my favorite film in the saga, but I really enjoyed it (even more so upon second viewing), and I appreciated that it added to the mythology of that galaxy far, far away. Maybe you felt differently. Maybe you were disappointed or (gasp!) hated Rian Johnson’s Episode VIII. And you know what? That’s OK, too. Believe me, it is. But you wouldn’t think that way if you’ve been on social media the past few weeks, with Last Jedi advocates and detractors waging their own Galactic Civil War over the film, even resorting to personal attacks against each other to further their point that The Last Jedi is the best/worst Star Wars movie. Ever. Something that should unite us only serves to break us into warring factions, and that shouldn’t be the case. This isn’t something that’s new among genre fans or even Star Wars geeks. If you were a message board devotee when the prequel films were being released between 1999 and 2006, you saw all manner of bitter back-and-forth as Original Trilogy OGs battled Prequel Trilogy Proselytizers for all-important affirmation that the things they liked were better than the things other people liked. With The Force Awakens, the quarrels continued, only this time the sticking point was whether or not geek culture lightning rod JJ Abrams had ripped off A New Hope to reboot George Lucas’ galaxy for the Disney Era. However, instead of these Star Wars shouting matches happening in the relatively confined space of message boards, they were now being waged on our Facebook feeds — not among anonymous strangers, mind you, but between loved ones. Now, you didn’t have XWing3855 ripping you a new one for your taste in movies, but your cousin Bob and your old high school classmate. It changes the whole dynamic, resulting in arguments that tend to devolve into personal attacks and block-worthy behavior quicker than you might expect. And now we have The Last Jedi, a film that takes a lot more chances than The Force Awakens (which really had to play it safer to reintroduce the Star Wars brand to audiences). As such, it’s the most divisive Star Wars movie since The Empire Strikes Back, and that divisiveness has spilled, naturally, onto our social feeds. 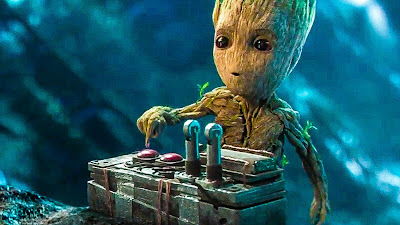 At a time when it’s already dangerous to have an opinion online, whether it be social, political or otherwise, voicing your thoughts on Star Wars at this point is like walking into a minefield. I haven’t blogged in this space since May 10. Mostly it’s because I’ve been busy (getting married will do that to you), but it’s also because defending an opinion on the Internet these days is an exhausting endeavor. I’d just as soon tap out a tweet and be done with it but, even then, I’m subject to paragraphs-long reprisals listing the ways in which I’m wrong. I’m sure others can relate. And look, I’m not saying I’ve never dipped into the “Dark Side” before. I’ve left comments online that I’ve later regretted. But when it comes to online discourse about the things that we love, I think we’d all benefit from stepping into the “Light” just a little bit in 2018. I know I will. Since you’re probably curious, here’s the long and short of it when it comes to my opinion on The Last Jedi. Keep in mind, these are just my opinions and do not reflect fandom as a whole. If you disagree, that’s totally fine, and I’d be more than happy to have a civil debate (the key word being “civil”) on the topic over on Facebook. Spoilers abound below, so consider yourselves warned. This film subverted just about every expectation I had, and I’ve never been this surprised by a Star Wars movie as an adult. I feel like that’s a good thing. There’s more to the Force than we learned in the previous movies. I appreciated that the heroes make a lot of mistakes in this movie. Sometimes heroes don’t live up to their own legend, and I think that’s an interesting theme to explore. Puppet Yoda is the best Yoda. This movie looked spectacular, both in terms of digital effects and set design. I want to visit Supreme Leader Snoke’s throne room. Speaking of the throne room, it was home to one of the coolest Star Wars fight scenes I’ve ever witnessed. More like that in Episode IX, please. Luke Skywalker is a badass. I loved everything about his character in this movie. Ditto for Kylo Ren. This is a different kind of Star Wars villain. The porgs were adorable and I want to own as many of them as possible. This is nothing against Laura Dern, but I wasn’t crazy about the Vice Admiral Holdo character. I feel like that role in this story (and her big moment toward the end) could have been given to someone else entirely. Princess Leia floating through space like a superhero genuinely made my cringe in the theater. It just looked goofy, and it actually got a laugh both times I saw the movie. That’s probably not the reaction Rian Johnson was looking for. I know the trip to Canto Bight helped to strengthen the relationship between Finn and Rose Tico, but after my first viewing, I couldn’t help but feel like a lot of these scenes weren’t completely necessary. Captain Phasma might be the most wasted Star Wars character of all time, which is a shame because Gwendoline Christie is a gem. 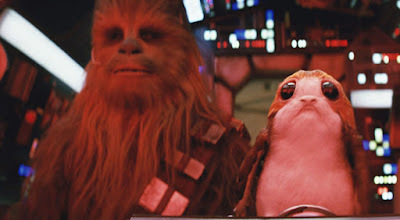 Porgs don’t really exist, and I want to own as many of them as possible.